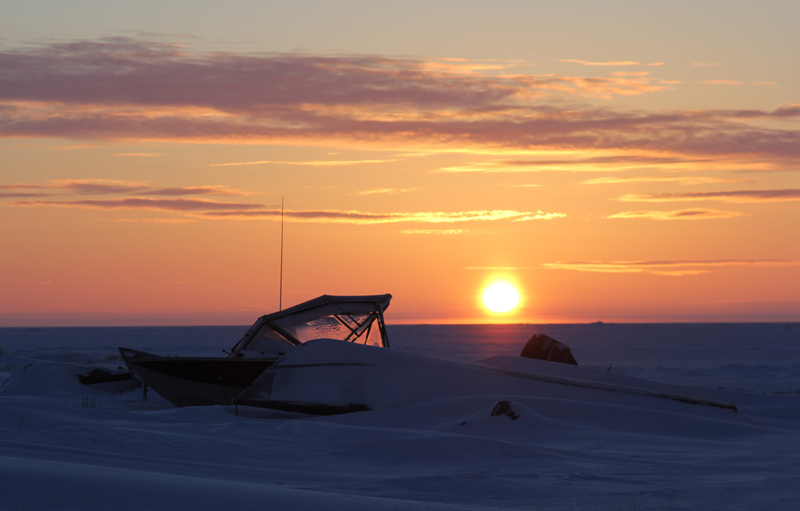 As the climate changes, subsistence hunters in Alaska are changing with it. With warm temperatures this winter across the state, sea ice is forming exceptionally slowly in the Arctic and Bering Strait regions. But subsistence hunters in small towns like Shishmaref, with a population of around 600 on a barrier island at the top of the Seward Peninsula, are finding ways to adapt. On a recent afternoon in late January there was finally a patchwork of ice covering the Chukchi Sea at the edge of town. As snowmachines zoomed past, Dennis Davis set up his new drone. “Some people think it’s a toy, but a lot of people know that it’s an actual tool,” Davis, 39, said as he attached propellers to the carbon-fiber frame. It’s a serious drone, worth about $5,000, with a high-quality nice camera mounted on the bottom. Davis plugged his iPhone into the controller and sent the microwave-sized device speeding out over the sea-ice. Looking down at the bird’s-eye view beamed directly to his screen, Davis pointed out nuances in the varieties of ice. According to Davis, blue ice is more solid than white. Those are areas hunters can travel across more safely as they search for marine mammal prey. Subsistence hunters in coastal communities like Shishmaref have always watched for these conditions. But the drone can scout further and faster than the naked eye. Davis crowd-funded for the machine to document the rapid erosion eating away at Shishmaref after storms, which has prompted a decades-long search for a new location to move the community. Journalists and environmental advocates have held up Shishmaref as a symbol for climate change’s looming threat of displacement. But as the ocean encroaches on the town steadily from season to season, residents still need to eat, pay bills and support themselves. 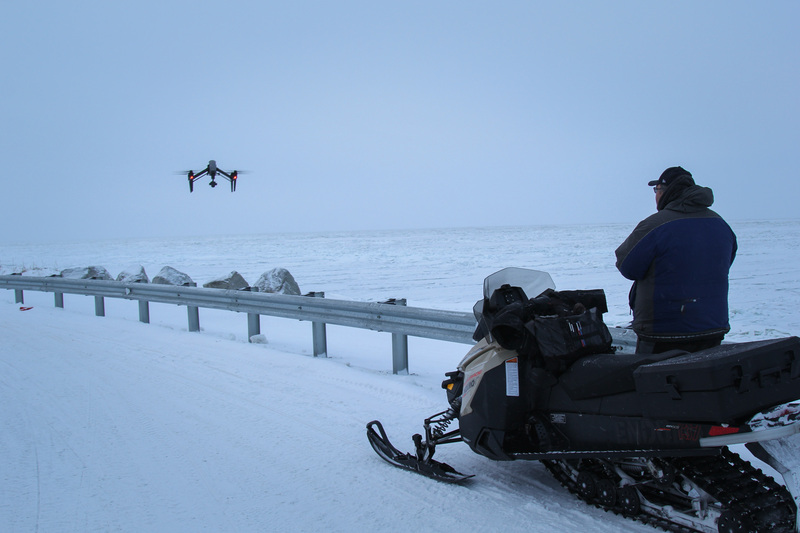 And so hunters like Davis are contending with diminishingly predictable environmental conditions, using technological tools like this drone to try and regain an advantage understanding what’s happening on the land and sea. “I’d just send out the drone and find the best available trail that they can use, instead of having to go out and just mess around on the ice,” Davis explained. Davis doesn’t use the drone to spot prey – something he believes would be an unfair advantage and gets into murky, evolving regulations over Unmanned Aircraft Systems interacting with wildlife. But he sees the machine as a new way to hunt animals more efficiently and safely, not unlike how satellite phones and GPS devices have become increasingly common in rural communities that rely on subsistence harvests. 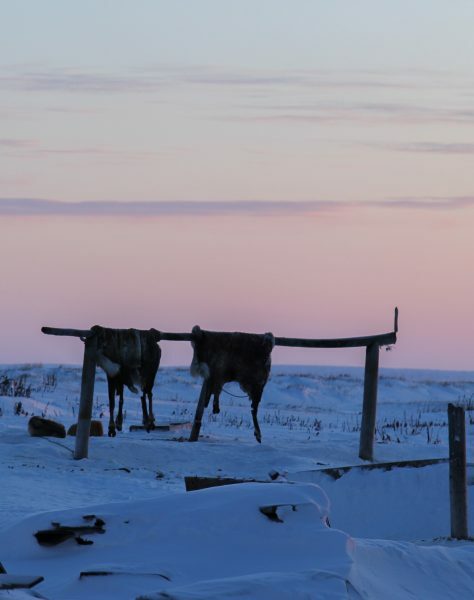 New technologies are just one way hunters in Shishmaref are adapting to changing conditions. There are others. People are changing not just how they hunt, but what they hunt. Traditionally, people in Shishmaref relied more heavily on marine mammals for food. 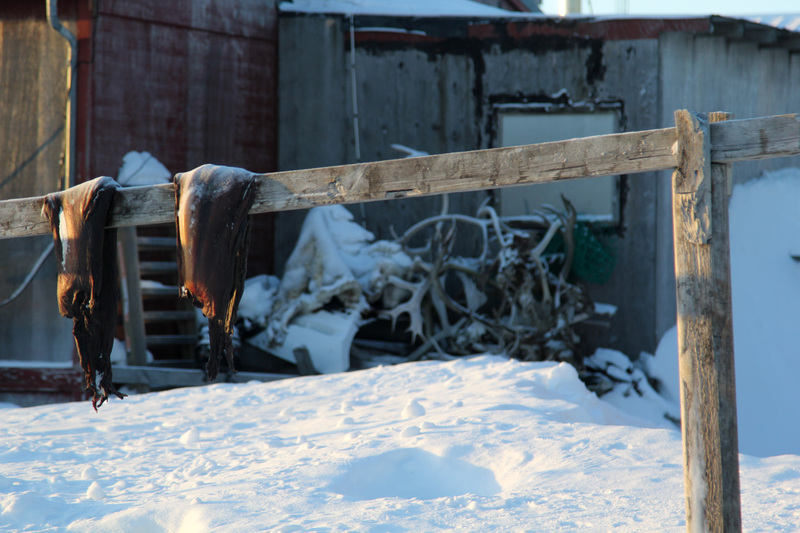 In the last few decades, residents say more caribou are venturing closer to town, increasing the local harvest. All around town, hides hang from porches and meat racks, ruby red haunches cure in the sun, and tangled piles of antlers rest on roofs. Salmon returns in the part of Alaska are booming, creating not only expanded subsistence opportunities, but more lucrative commercial harvests. And musk oxen, giant prehistoric goats which were wiped out of Alaska in the 1800s were reintroduced to the mainland just fifty years ago and are steadily working their way back into people’s diets. In fact, it’s one of Davis’s favorite sources of protein. 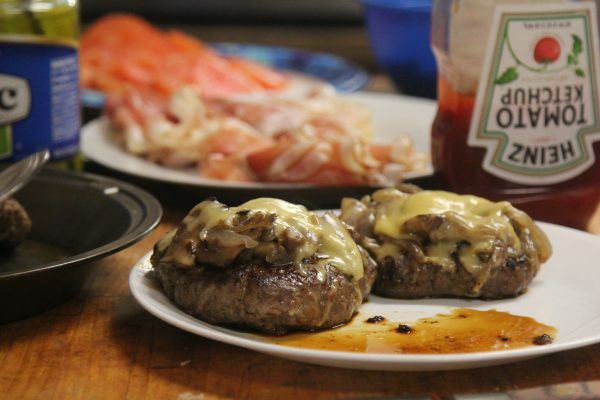 Back at his home, he fried up a house special: musk ox burgers. “I compare musk ox to waygu beef, because it’s so marbled,” Davis said, referring to the highly prized variety of Japanese beef cattle. Davis likes to cook about as much as he loves to eat. But subsistence isn’t just a culinary hobby. 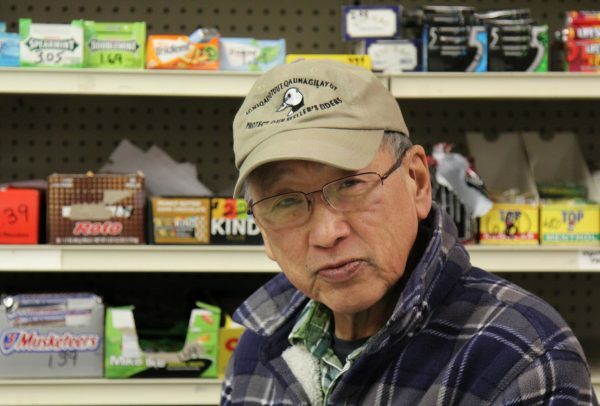 For him, like for most people in Shishmaref and indigenous communities across Alaska, it’s a necessity. Davis and his wife have all seven of their kids living at home. Dinner tonight is self-serve, with everyone grabbing burgers as they come off the stove. By the time it’s done, all eight pounds of meat that he mixed together is gone. Buying this much frozen ground beef at the store would have cost up to $70, a per-meal cost that is out of reach for many in rural communities where jobs and cash are scarce, and everything costs several times as much as it would at a super-market in the Lower 48. Even water. Like many rural Alaska villages, Shishmaref lacks plumbing and easy access to potable water. At the store, a gallon of it costs $11. For those who can get a permit to hunt them, musk oxen have become a relatively reliable source of meat. That consistency is a relief, because environmental conditions are making ocean hunting less and less predictable. In years like this, when the sea ice forms later, it doesn’t get as thick, and come springtime it disappears much faster. That’s a problem for hunting ice seals, walrus, and bearded seals, which everyone in Shishmaref calls by their Inupiaq name, oogruk. “Going oogruk hunting or walrus hunting, you can go like 30, 40, 50 miles without seeing something,” Davis said of the last few years. It hasn’t always been that way. In fact, it’s a pretty recent development. It isn’t that there are less animals; it’s just that as they follow retreating sea ice they are distributed further from the town – prompting hunters to travel greater distances searching for them. In a study published last fall, state researchers interviewed 110 coastal residents over 10 years and concluded that marine mammals are still plentiful, but access to them is getting harder, with worse conditions during shorter windows of time. As the sea ice retreats, the animals follow. That’s a chase that’s not only more expensive for hunters, but creates more hazards as weather and sea conditions become more variable. Last year Davis went almost all the way to Kotzebue, about a hundred miles away, looking for oogruk. On the way back the weather took an unexpected turn, nearly costing the hunting party all their equipment. Changing weather patterns are one of the biggest differences noted by some of the community’s elders. “The way we hunt oogruk or seal hasn’t changed. The conditions have,” Percy Nayokpuk, 65, said. Nayokpuk runs a store in town and is Davis’s father-in-law. This year’s is the latest freeze-up of the ocean he ever remembers. Nayokpuk has seen plenty of shifts in the animals around Shishmaref – some good, some bad. The unpredictable weather worries him. But he’s encouraged that younger hunters are constantly adapting. “We’ve always been hunters here, we hunt regardless of the situation,” Nayokpuk said from behind the counter as his store. For those tracking subsistence across Alaska, the sense of uncertainty comes with a degree of optimism. “It’s positive in my mind that our people are able to adapt. And they’re doing so,” Brandon Ahmasuk said. 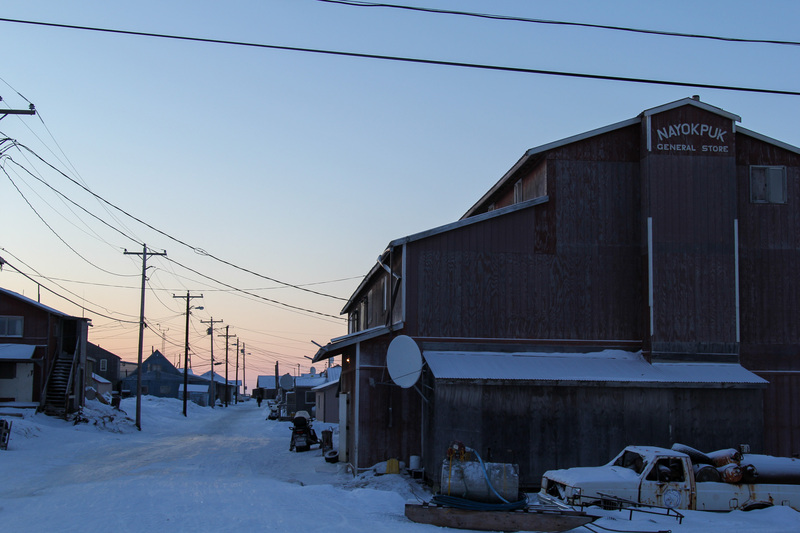 Ahmasuk manages subsistence resources for Kawerak, the regional non-profit in Nome that works with 15 smaller communities around the Bering Strait. Some hunters are taking advantage of new opportunities created by environmental changes. Open water later in the year around St. Lawrence Island, for example, has meant more bowhead whale harvests for the town of Savoonga. The longer travel to reach hunting grounds requires more money for gas, leading communities to pool resources. With healthy food basically unaffordable at local stores for many residents, hunters have no option but to adapt. Ahmasuk’s big worry is whether a changing climate could affect animal populations and their health in the coming years, a worry prompted by several unusual die-offs the last few years, as well as instances of avian cholera and toxic algal blooms. But as long as the animals are healthy, Ahmasuk is confident people in the region will find ways to live off them. This journalism project was made possible by a fellowship from Marguerite Casey Foundation, which supports low-income families in strengthening their voice and mobilizing their communities to achieve a more just and equitable society for all.